ALOHA - Ask, Listen, Observe, Help, Ask Again. These are outlined very early on as the fundamentals of being a caregiver. Yet as we know, and the characters here come to understand, that isn’t enough. In fact, there’s no acronym or catch phrase that would say enough explain caring or what it takes to care for someone. Ben (Paul Rudd), is separated from his wife, and is without a job. So he takes a course to become a caregiver only to end up caring for a vulgar teenager that may or may not become a surrogate child for him. He’s Trevor (Craig Roberts), a teenager with Duchenne Muscular Dystrophy, but an otherwise upbeat demeanor. That is, of course, until Ben challenges him to get out of the house and take a road trip to see all the lamest roadside tourist attractions he's seen on TV. Once they do get out on the road it becomes a mildly enjoyable buddy film with at least a couple of humorous gags. One involves Ben putting his foot down when a tourist attraction won’t accommodate Trevor because he’s in a wheelchair. They force the staff to carry Trevor, wheelchair and all, up a flight of stairs to see an attraction that turns out not to have been worth the effort. Even if it doesn’t sound that funny in writing, Rudd sells it well and it doesn’t hurt that there’s some snappy editing to the scene. But once they get back on the road, two more cliche characters show up to remind us what kind of movie we’re watching. “The Fundamentals of Caring” is one of those films where you can see the wheels turning the whole time. It’s a film that wants us to tear up while it teaches its characters lessons it thinks will move us. Ben is the depressive sad sack who's lost everything, including a young son, and finds a chance for redemption of some sort in being fatherly to Trevor. Trevor uses humor as a defense mechanism by playing practical jokes on his caregivers to keep them emotionally at arm’s length or, better yet, scare them into quitting. But because we understand how these kinds of movies work we know Ben can take the jokes in stride and even throw some back Trevor’s way. But even if we’ve seen these types of characters many times over, the two female characters that come along halfway through the film add nothing but more cliches. Dot (Selena Gomez) is a vulgar, free-spirited hitchhiker running away from home, and Trevor falls for her instantly. Peaches (Megan Ferguson) is a pregnant woman whose car broke down on the highway and needs a ride far enough away to keep our two buddies traveling just a little bit longer. Both Dot and Peaches very transparently amount to little more than devices with which to challenge our two male leads. Dot helps push Trevor to try new things, and Peaches reminds Ben of the child he lost -as if Trevor wasn’t doing that enough as it is. Of course, all of these characters have daddy issues in one way or another or exist to make the other characters confront their daddy issues. I’m not sure how it could have been more contrived to put, not only, these two characters together, but then to also have everyone they meet on the open road be dealing with such similar unresolved issues. Worse yet, once the female characters show up, the film drops nearly all attempts at comedy in favor of melodrama. 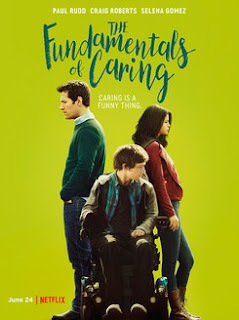 To their credit Paul Rudd and Craig Roberts sell it pretty well, but by the end of the film I had already seen through this film long enough not to care what lessons their transformative trip had taught them. About the only reason to see this film is for Rudd and Roberts performing together. They both give performances better than this bland script deserves. It manages a few laughs, and it certainly tries to pull the heartstrings from time to time. It’s a shame it relied on so many cliches and broad comedy rather than a character driven narrative.